This July 11-13, there will be the first of several proposed pre-Congreso events to take place throughout the Mundo Maya in preparation for the upcoming Congreso next year. This first event will take place in Cobán, Alta Verapaz, Guatemala, and it is designed to instruct Maya teachers from Q’eqchi ‘, Poqomchi’, Sakapulteko, Uspanteko, Achi, Ixil, Mopán, Itzaj, and Ch’orti language communities who have not yet had access to resources and instruction concerning the Maya hieroglyphic script. Organized by members of the PLFM and supported in part by MAM, this event inaugurates a new chapter in our collective efforts to help Maya teachers and students reconnect with their history. With the help of members like you, we hope to be able to work with our Maya colleagues to provide consistent and reliable support as our collective efforts bear fruit. Stay tuned for our official invitation to subscribe! This month’s report from the field is from the exciting work of Leonel Pacay Rax of San Juan Chamelco, a Q’eqchi’ community from Alta Verapaz, Guatemala. 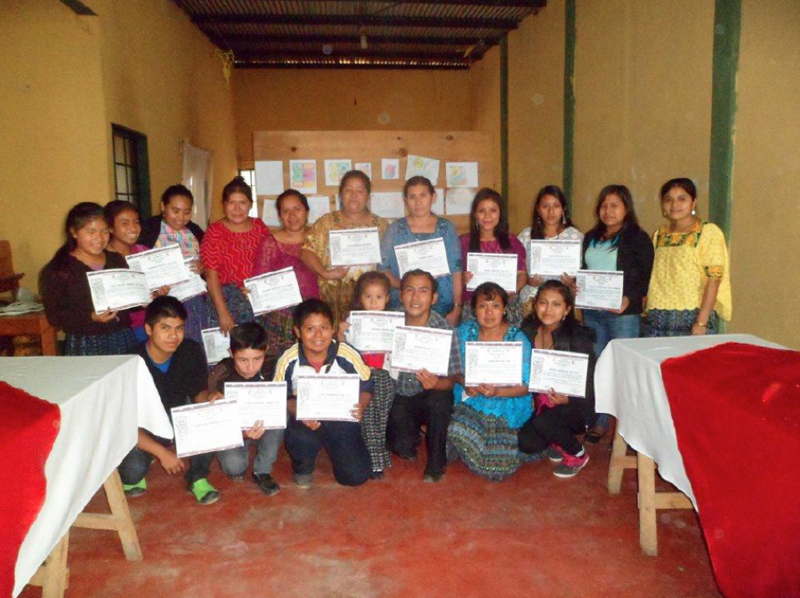 In this report, Leonel describes the formation of the Centro de Aprendizaje de La Escritura Maya Yaxtun (CAPEMAYAXTUN), in which Q’eqchi’ Maya students have been able to learn about the Maya script and network using an interactive, online Facebook discussion group. Leonel writes so eloquently and articulately, I’m afraid my English translation does not do justice to his elegant prose. Please enjoy reading this report, long overdue from a workshop held last October. Location: San Juan Chamelco, Alta Verapaz. Alta Verapaz is a department to the north of Guatemala with a territorial extension of 8,686 km², located in the Coordinates 15 ° 30’00 “N 90 ° 20’00”, made up of 17 municipalities with a population of approximately 1,200,000, with more than 90% of the population identified as Maya, where Q’eqchi’ is the second language with the highest number of speakers nationwide. The Q’eqchi’ people have always been characterized by valuing their customs and values which have been transmitted from generation to generation over the years, which has strengthened and kept alive all the cultural richness that characterizes the region of the north of the country. The majority of its population has an average of 16 years so it is generally considered young, which can be considered as important and valuable data. The majority of the population is dedicated to agriculture, with emphasis on the cultivation of coffee, cardamom, pepper and cocoa, among the most important and relevant in the population. Epigraphy (from the Greek language επιγραφή: written on) is both an autonomous science and at the same time ancillary to history, in which inscriptions on durable materials are studied, and in which methodologies for reading and interpreting them are established. The purpose of epigraphy is the deciphering, reading and interpretation of the inscriptions in order to obtain as much information as possible. According to international conventions (especially for Unesco), the existence of epigraphy is a marker that indicates the transition from a prehistorical to a historical culture, especially when these inscriptions include annals and chronicles. We have seen a brief definition of Mayan epigraphy and we understand that it is dedicated to the study of ancient writing which allows us to describe the written messages of the ancestors who enshrined all kinds of messages in stone, based on universal rules of language, their norms of oral and written use, and their meaning. As a means of communication of the human being, language constantly undergoes changes in its structure by the same speakers who are evolving their forms of communicating and this has led them to make in-depth studies about new ways of communicating, “new forms” that were used in antiquity but that have fallen into disuse due to lack of interest and due to same situation that led to the extinction of the Maya of antiquity. For this reason, we can find writings from any geographical location that includes the entirety of Maya culture. Linguistics has a broad field of study that requires exhaustive research to profoundly understand its structure in its different phonetic, phonological, morphological, syntactic and semantic levels. Within this, it has been found that epigraphy has been used for thousands of years, but little by little, it has been discovered and the knowledge has evolved, awakening in the human being the interest to learn much more. At present, there is a phenomenon of acceptance of the Maya language in different fields of work, both public and private; It is considered no longer a necessity but an obligation, “to do a more efficient work I have to understand the people for whom I am working”, but this also has aroused an interest in epigraphy which has been seen in schools with students from the primary level to the university level. It is necessary and important that the professionals know the culture and be aware of the needs that the population demands. 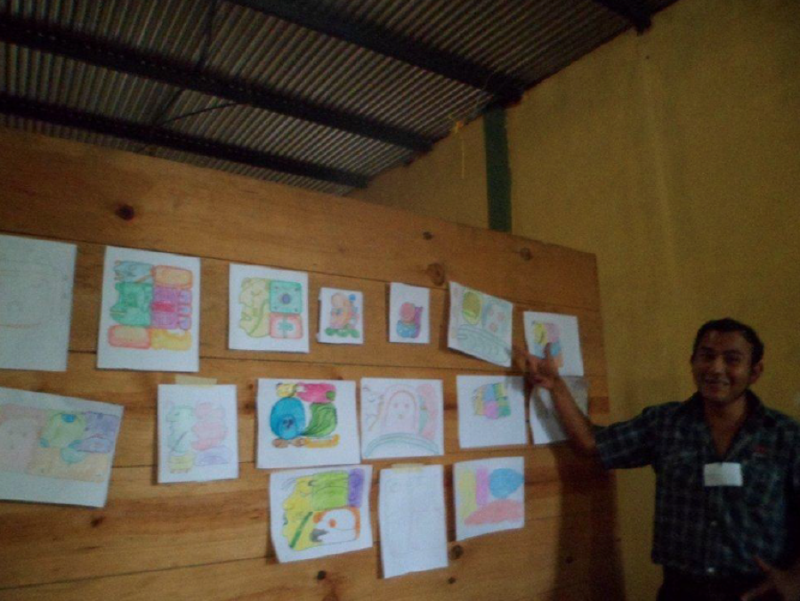 We consider it important and necessary to bring the knowledge of epigraphy to the different municipalities of Alta Verapaz, taking into account that the majority of workshops have been carried out in the municipal center. For this reason, on this occasion we considered to carry out the activity in the municipality of San Juan Chamelco. The high interest and the collaboration of people to coordinate the place to carry out the activity was noted, and the planning of the activity was performed for which we presented the results, which were made possible by the support of each of the participants in the activity. 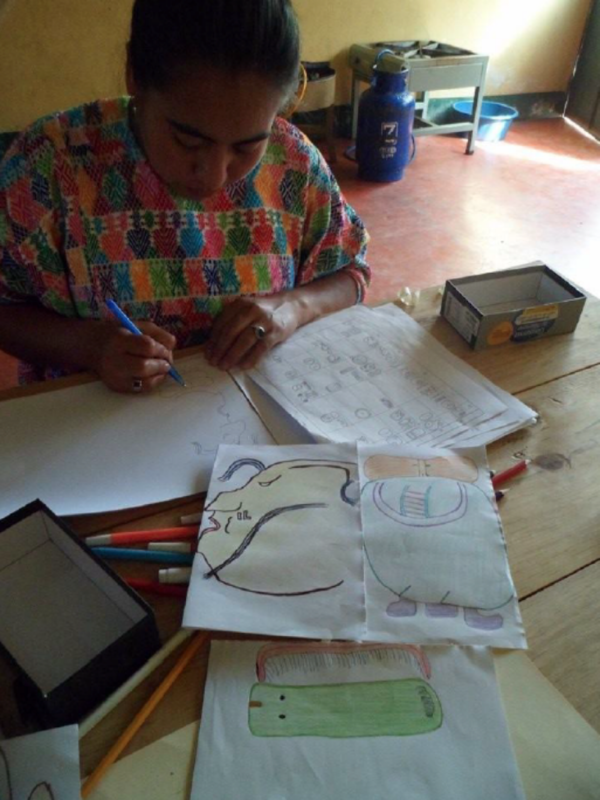 To educate children and young people about the learning of Mayan epigraphy that will enable them to decipher the writings of the Maya in different parts of Guatemala in the future. 1. 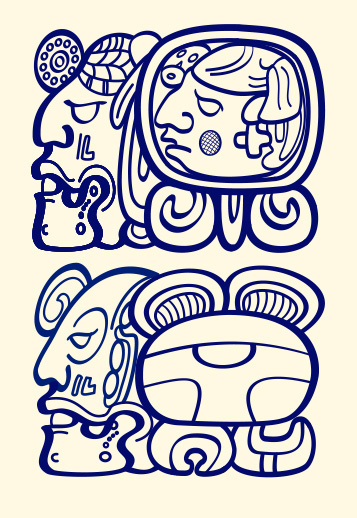 Identify the meaning of the Maya glyphs found in texts as the product of expert research on the subject. 2. To strengthen the language skills of children and young people through Mayan epigraphy as a means of communication through their own language. 3. To disseminate the knowledge of Mayan epigraphy to children and young students at the primary and basic level of public establishments in both urban and rural areas. Children from fourth to sixth grade in primary school and youngsters from first to third grade who identify with their Mayan language and Q’eqchi’ culture. A) Knowledge of the principles of Mayan hieroglyphic writing. B) Eager to share and expand his knowledge of Mayan epigraphy. C) Replicate the knowledge acquired with young people with whom they live in their community or establishment. D) Willing to participate in upcoming events to continue their training. Every participant is awarded a diploma at the end of the course provided the completion of 100% attendance. 1. It was attended by 22 people including children, youth and adults, all at a beginner level. They were motivated by learning the Mayan epigraphy, something new and interesting for most. 2. There was an active participation of each of the participants in each of the topics developed. 3. Children and young people with mastery of the syllabary which allowed them to be able to form their names and leave it reflected in the worksheets provided to them. 4. 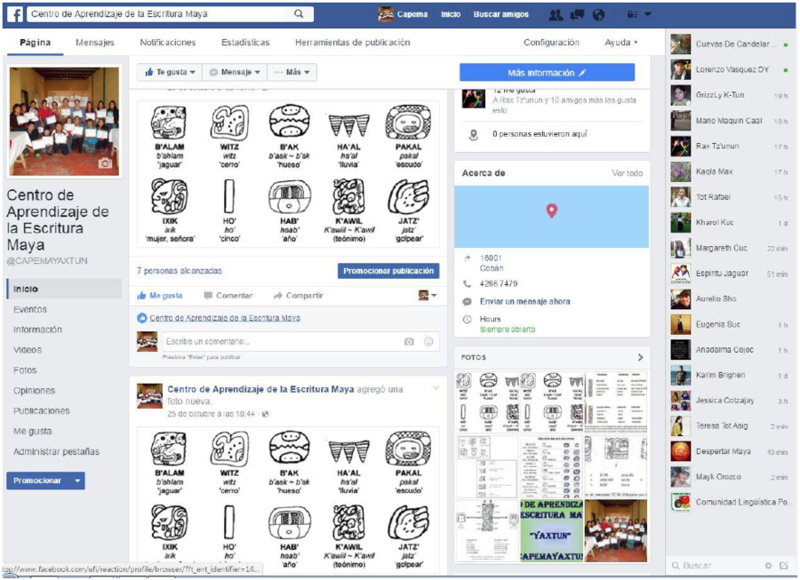 Creation of a Facebook account to publicize the next activities of the group and share and exchange information with each of those who like the Mayan epigraphy. 1.Children and young people are motivated and committed to replicate their acquired knowledge to neighbors, friends, study partners. 2. Support of Victoria Gricelda Tun Mucú as facilitator of the workshop, this person was one of those who has been interested in forming in the study of Mayan epigraphy, actively supporting the development of the workshops that take place. 3. Very important support of Byron Rafael Xi Tot for the organization of the workshop. 4. Formation of a Teaching Center for Maya Scripture “CAPEMAYAXTUN” for all individuals or groups interested in taking courses in Mayan epigraphy, hoping that we may have integrated to this group people who know Maya writing and others interested in expanding and applying their knowledge to new groups. 1. Commitment of students to organize epigraphy workshops to involve more people in learning something that for many is new and unknown to others. 2. Group of teachers of Fray Bartolomé de las Casas and other municipalities interested in the realization of an epigraphy workshop, which is being coordinated. 3.To hold monthly, bimonthly or according to the availability of time, to converse subjects of Maya epigraphy, which was proposed by the participants. We are grateful for the support provided by MAM, its support team, its President Michael Grofe, Bruce Love and many others, for the realization of this event, with which we began to spread knowledge about Mayan epigraphy, hoping to continue to count on the collaboration they have always provided. There is a lot of work to be done and resources are needed to reach out to each of the groups concerned, hoping that more groups and organizations like MAM can join and integrate to enable more support. Thanks to MAM for the support they have given us, we hope to continue to count on you and bring the knowledge of Maya Epigraphy to more people, since there is much to do but we need support to continue working which we do with great joy and pleasure. And we continue to train ourselves and every day learn a little more of the great deal there is to know about Maya writing. Impressive number of events to teach hieroglyphs to school children and local people. It is helpful to provide information to today’s new generations. We (FLAAR Mesoamerica, registered in Guatemala) visit schools in remote areas (4WD, then hiking up or down steep hills because not even mud road reaches the schools). We donate printed posters and banners for the school teachers to hang in the school walls. For teaching numbers, we have the Mayan numbers along with Roman and international numbers. We work primarily in Q’eqchi’ Mayan areas and in some areas know the local alcaldes, school teacher groups, etc. We have three Q’eqchi’ employees, 2 Kaqchiquel, and have access to Pokomchi families and schools also. Our research is primarily on underutilized edible and utilitarian plants, and on birds, mammals, reptiles, amphibians, and arachnids in the Popol Vuh saga or in Classic Maya art (www.maya-ethnozoology.org).